Sometimes recipes come to me with no effort at all, like when someone gives you free cake on your birthday. Other times I have to chase them down like a disobedient child throwing a running hissy fit. This recipe was of the former category. It hit me one day as I was jotting down website ideas. 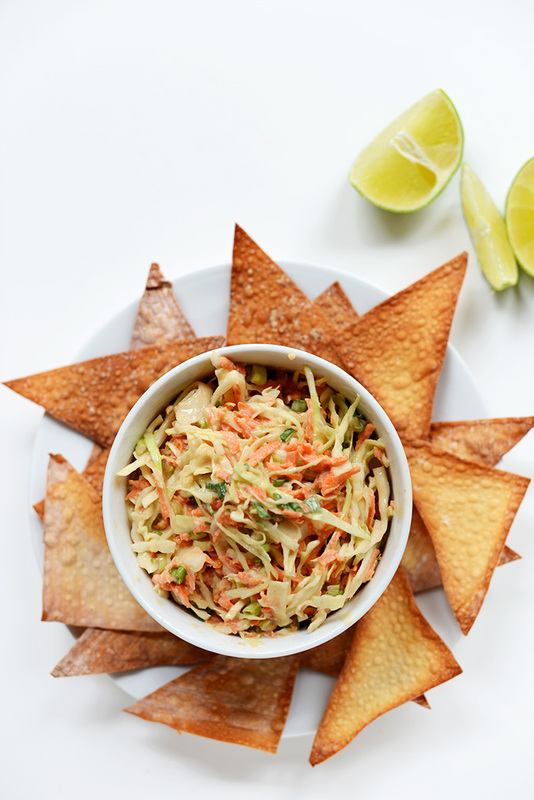 CREAMY THAI SLAW WITH BAKED WONTON CHIPS. Yep. THANKS RECIPE. You were simply meant to be. It starts with chips. Baked chips, in fact. I do like the fried variety but will probably never make them myself because I don’t fry things. It scares me and I fear my arteries will see what I’m doing and seize up before I ever take a bite of said fried good. I’ll eat a Pronto Pup at the state fair no problem. But you will likely NEVER see me dipping a battered dog in my own pot of oil. Plus, I’d probably burn myself and then John would ban me from the kitchen forever because I’m already prone enough to accidents in there. Whoa, that escalated quickly. Bake to zee dip. The slaw is so simple and fresh AND can be made dairy-free and peanut-free no problem. Sub mashed avocado for yogurt /sub almond or cashew butter for peanut. 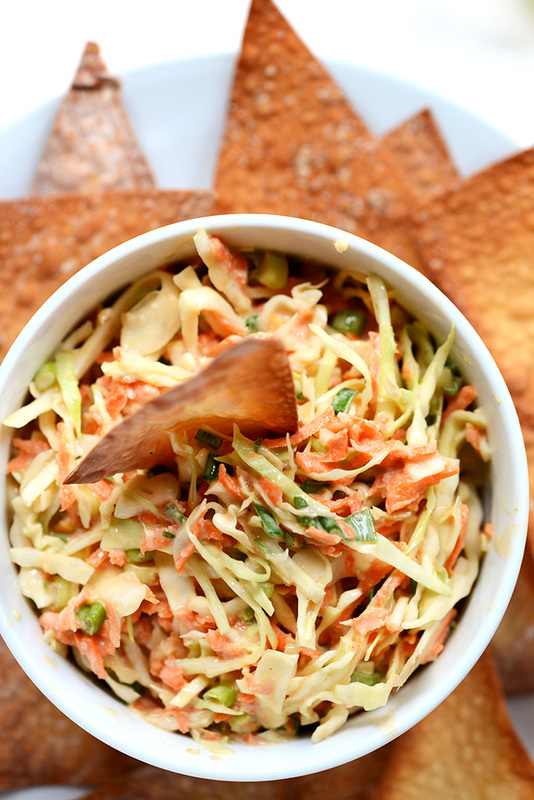 This slaw is so flavorful and crunchy! Slightly creamy with plenty of peanut flavor, sweetness, and tang from the lime. I’m kind of smitten with it, especially when served with baked wonton chips. Tortilla chips, you’re cool and all but, you’re no wonton. Just sayin’. Make this dip for a super fresh and easy appetizer for parties or gatherings. Make it before eating Pad Thai. Make it for a picnic and then take it on said picnic and eat it. Make it for a frand who loves Asian food. Just make it. You get the point. 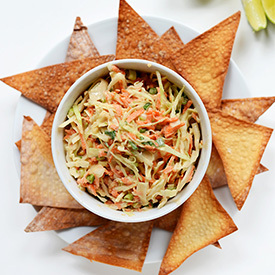 Creamy thai slaw made with simple, fresh ingredients and baked wonton chips. 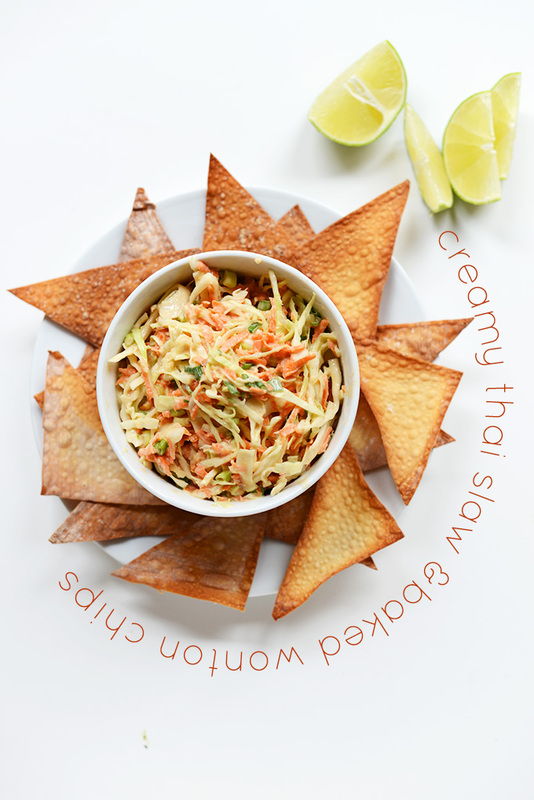 A super light and healthy Thai appetizer or snack! Preheat oven to 400 degrees F (204 C) and cut wonton strips (or egg roll wrappers) into small triangles. Spray chips lightly with olive or avocado oil, sprinkle with sea salt and arrange on a foil-lined baking sheet in a single layer making sure they don't touch. Bake for 6 minutes or until light golden brown. Set aside. While baking chips, whisk together the slaw dressing ingredients. Taste and adjust seasonings as needed. Add veggies and toss. Serve with wonton chips immediately. Will keep covered in the fridge for several days. *You can sub 3-4 egg roll sheets for the 10-12 wonton wrappers. I did two three twists for a New Year’s Eve Party. cut the sesame oil down to one teaspoon for my fat limitations (hate to do this because I love the flavor, but have to). I don’t know what I did wrong, since I thought I followed the recipe, but my slaw was soggy and limp two hours after I made it. Also had what someone else described as a “chalky” texture. I’m sorry, it sounded so delicious! You’re a gifted soul and I give you A TON of gratitude after every single meal made from your recipe(s). To publicly rejoice is the only way to give more gratitude! 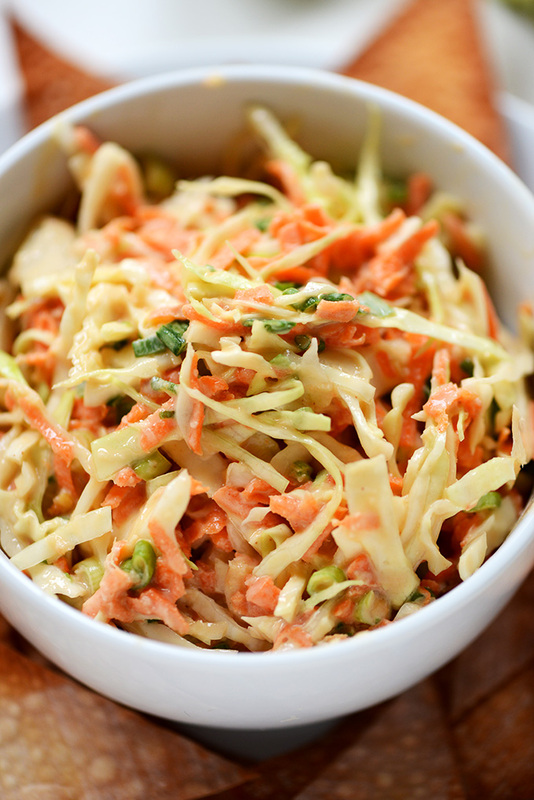 The whole family digs this slaw!. I Prepared once with vegan mayo and once and greek yogurt. I noticed no difference in flavor. Thanks so much, I think your site it a haven for anyone who thinks they are to busy to cook from scratch. Simplicity and deliciousness all around! Cheers. Hey great recipe, I made this last night and it was pretty darn good but…. Is 1/4 cup of lime juice a bit much? I followed the recipe exactly (without tasting along the way, my fault) but wow the lime flavor pretty much blew everything else away, even all the seasoning of the stuff I put it on. Just a caution for those that aren’t expecting it- Google tells me 1 lime is about 2 tablespoons worth of lime juice not 1/4 cup (4 tablespoons). Great recipe though, I will be adjusting it and using it going forward. Thanks! Thanks for the tip, Chris! I prefer things very citrusy, but I’ll note this in the recipe. Thanks for sharing! Glad you still enjoyed it! Awesome thanks for a quick reply! Keep up the good work! 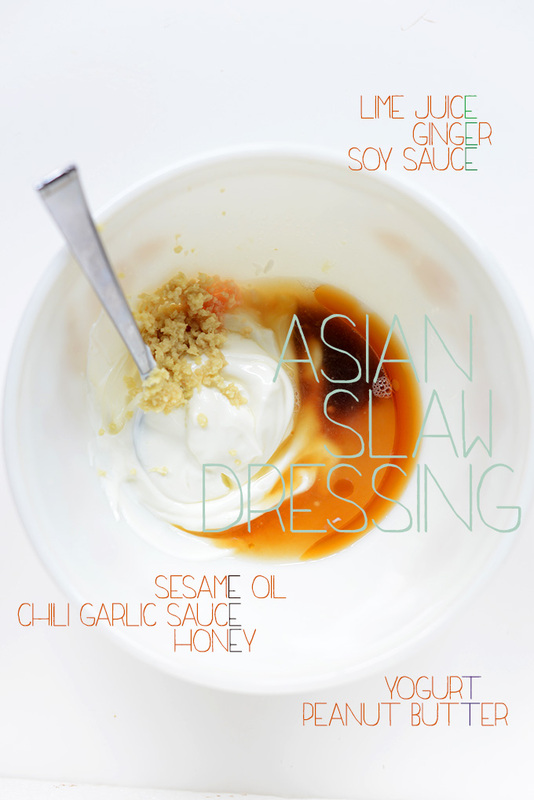 Can’t wait to make this, but can you explain what the chili garlic sauce is? I live in the country and typically either order online or have to make a specific list when driving “into town.” Any advice on choosing a good one? Thanks! Made it tonight and it was delish!! I wasn’t able to use the chili paste since I am going to the city tomorrow, but otherwise it was fantastic. I did notice that it had a weird chalky texture though and a friend said that it might be because my cabbage was more white than green. Could that have been the issue? Appreciation to my father who informed me regarding this blog, this website is really amazing. Everything about this made me smile. The recipe itself (because, yum), the use of the word “frand” over “friend” (because, really, that’s how you say it!) and the mention of Pronto Pups at the state fair. I don’t eat ’em anymore, but holy nostalgia, they are a time-honored tradition with my two best childhood friends. You hadn’t been to the fair unless you’d had AT LEAST one Pronto Pup. Glad to see that someone else understands this. Oh good goodness, does this look refreshing! 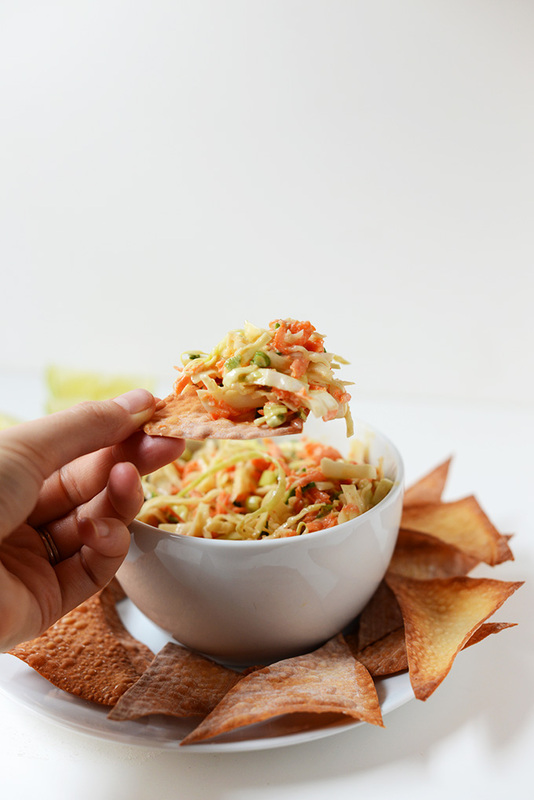 I love slaw in the summer and these Asian flavors are calling my name (as are the wonton chips). Perfection! I have the exact same fears when it comes to deep frying things! I know I am going to burn down my apartment or at least burn my fingers and arms! This slaw looks incredible! I can’t wait to try it! Alright friend – are you secretly planning a little trip over to Thailand on the sly? You are all over these Thai-inspired recipes! 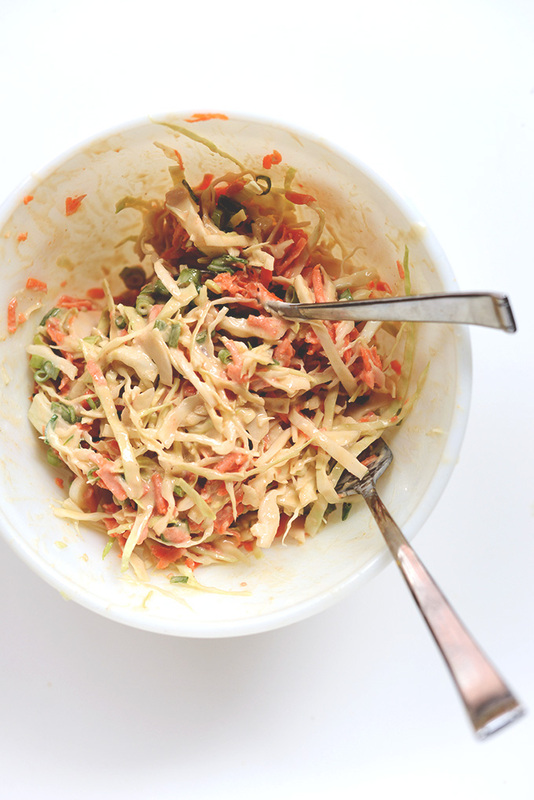 I am swooning over these pictures and the flavors inthat slaw. 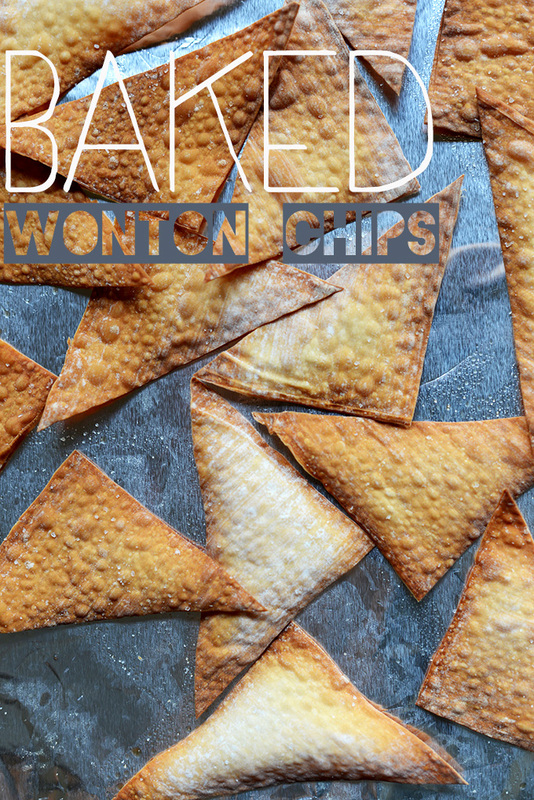 And baked wonton chips? Will be making these – stat. Seriously amazing. Maybe…??? Ha, that would be awesome – then we could hang out and eat Thai food! Hooray! Love the idea about making this vegan…I will give it a whirl. Love the pictures and the recipe is so yummy and good. Wow, this looks amazing! I bet I could make it vegan by using vegan mayo instead of the yogurt! Yum. Kelly, yes! I didn’t even think of vegan mayo. In the recipe, I suggested using blended avocado in place of yogurt, but that’s a great idea, too! Wow this looks great, can’t wait to try! The slaw sounds fantastic, especially that dressing! I love a good thai slaw! This sounds fabulous! I love when recipe just come to me! Make my life so much easier! These chips and slaw look and sound amazing! I love that the chips are back and anything Thai is always a winner! Ummmmmm, now that you say that, ME TOO. Oh MAN. I am pretty psyched about this recipe. I am in love with asian-y slaws, and now I can eat them on asian-y chips?!?! All the yes.